SAL DeTRAGLIA'S VIRTUAL TAPAS BAR: LET’S PARTY LIKE THERE’S NO TOMORROW! At 10:23 this morning in Bar Alcázar, all heads turned when a strange man reading a local newspaper suddenly gasped. That strange man was me. The newspaper was the March 11, 2005 edition of Henares al Día. And the reason I was gasping? See the advertisement in the lower portion of the above photo. The Nuclear Power Plant of Trillo. Promoting the culture, the festivals and the traditions of its surrounding communities. 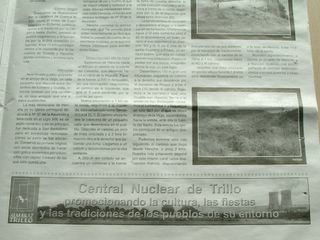 I look forward to attending Trillo’s annual festival this summer. I understand that the highlights will be an asbestos-filled balloon toss, followed by a demolition derby comprised solely of Ford Pintos®. Your guys could join up with the guys from the next pueblo to us, Palomares, which has regular radioactive get-togethers after the four nucular bombs fell on and around it in January 1966 (an accident with a B52). Based on the combined content of this post and your Comment, perhaps RNE should consider re-naming itself "Radioactive Nacional de España." Welcome back, amigo. Hope you had a good holiday.